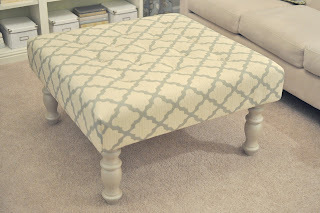 I am so excited to share with you my most recent project... turning an old table into an upholstered ottoman! It was actually really easy and I think the result is a very professional looking ottoman! Here's how I did it. I already had this coffee table, but you could easily find one like this on Craigslist or maybe you already have one around the house. Anything that has legs that you like and an easy shape to cover will work. 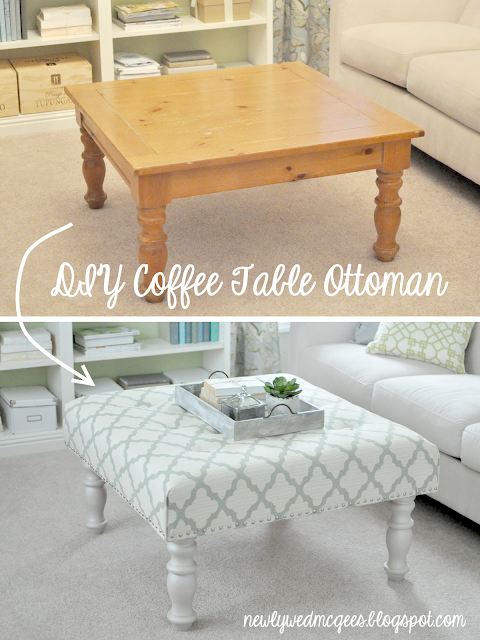 If the table is taller, you can cut the legs down so that the ottoman will be comfortable for resting your feet on. This one was fine, so I didn't do that step. First, I painted the legs. You could stain them or leave the legs as they are, whatever you prefer. I used Martha Stewart Light Reflections paint and gave the legs a slightly distressed finish. Annie Sloan Chalk Paint would be a great option too. Because of the shape of my table, I added wood around the bottom, so that the finished shape would be straight on the sides and I would have something to hammer my nail heads into. 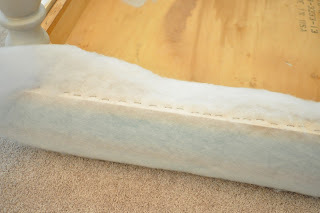 If you are going to want to add tufting to your ottoman, go ahead and figure out the placement of the buttons. For my square ottoman, I decided to use this pattern of button placement. 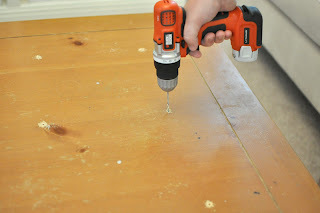 Drill holes in your table(!) where the buttons will go, so that you will be able to thread a long needle through later. 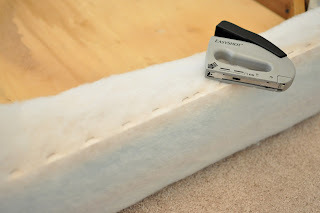 Cut your foam to fit the top of the ottoman. I used 2" high density foam from JoAnn's fabric. It usually cost's about $32 a yard, so be sure to get it on sale or use a coupon! To cut the foam, use a marker to draw a straight line and then use a sharp blade, like an Exacto knife, to cut through the foam (a serrated knife from your kitchen even works well). 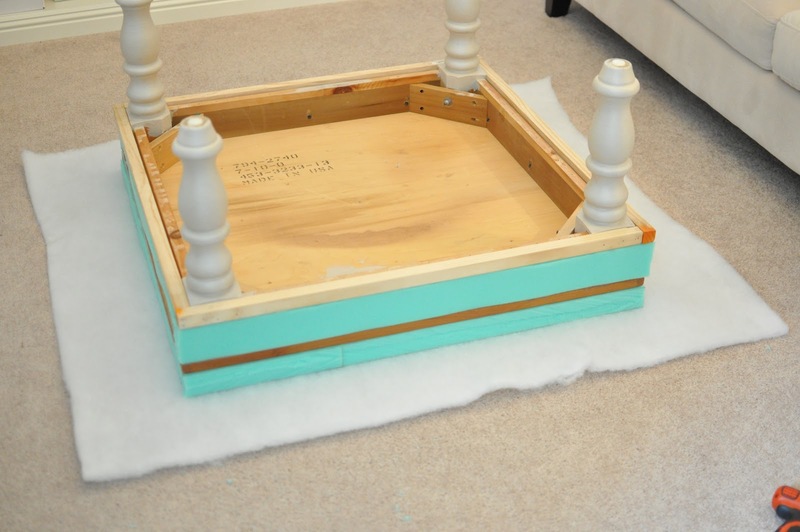 Use spray adhesive to glue your foam directly on top of the table. Next, I cut foam strips to go on the sides. This makes it comfy on the sides so you won't hurt your leg if you bump into it. Use the adhesive to get it to stick and stay in place. At the end of this step, you should start to see your ottoman coming together! Cover the foam and table with batting. 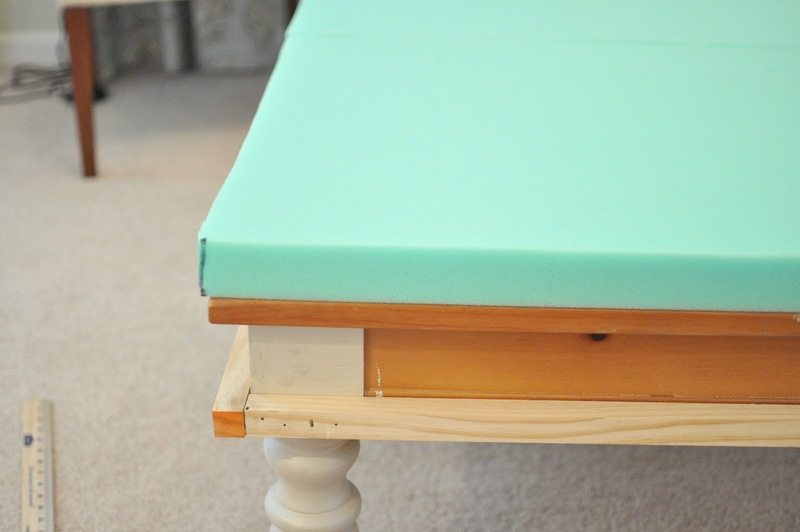 Use a staple gun to staple the batting to the underside and pull tightly to get the shape on top that you like. I cut out and stapled down the excess fabric on the corners and underneath, so that there was no extra batting hanging down. Now your table is really starting to look like an ottoman! Place your fabric on top of the ottoman and make sure you have it lined up properly if you have a geometric fabric. I tacked it in some places on the bottom to make sure it stayed in place. 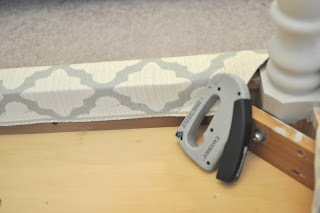 Flip the table over and staple the fabric to the wood. Work around the sides making sure it is pulled tight. I made straight seams down the side on the corners, but you could do a lot of different things to finish the fabric at the corners however you like. To add the buttons, push a long sturdy needle straight up from the bottom, through button covered in your fabric, and then back down. 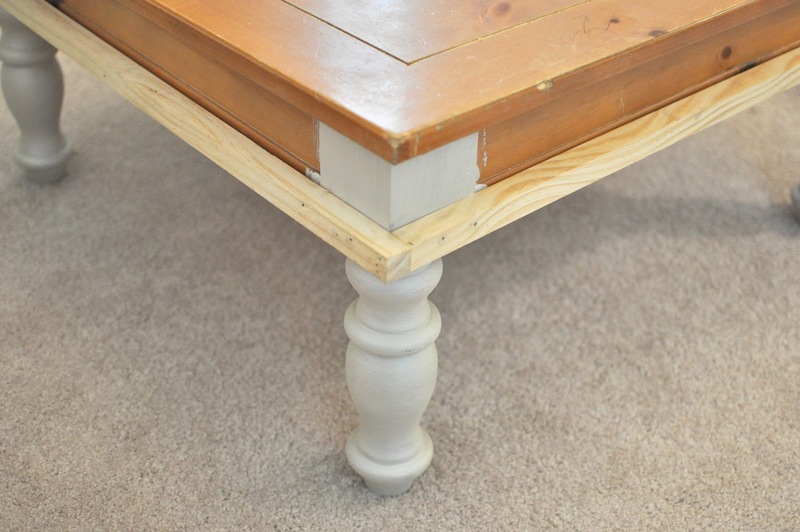 You can secure the knot on the underside of the table with another button or some nails to hold it in place. 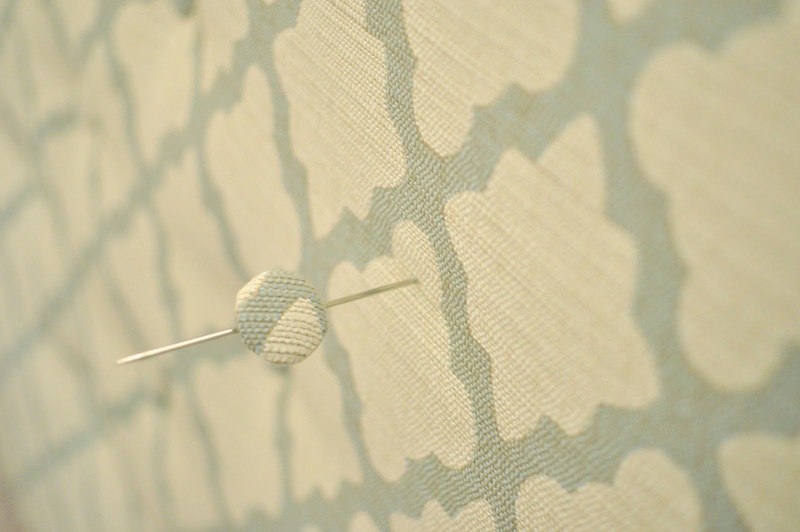 Make sure you use heavy duty upholstery thread, it won't break from the tension. Pull all of the buttons so they are equally as deep in the foam as the rest. 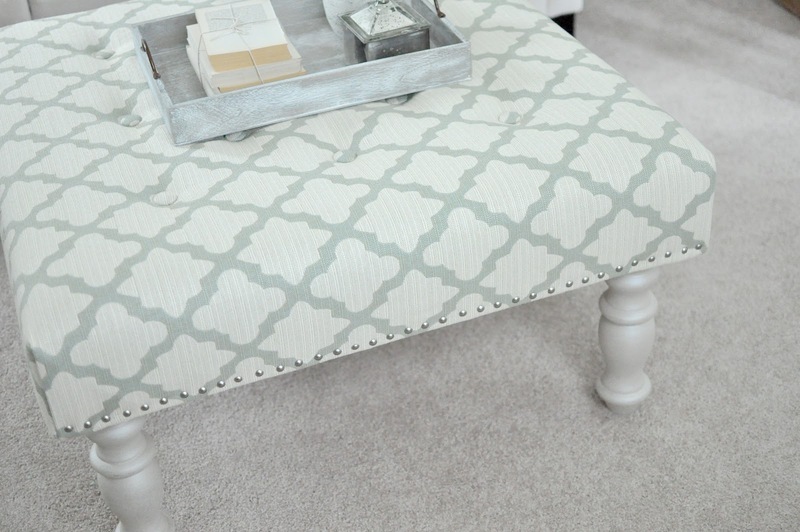 The last step is to add decorative nailheads along the base of the ottoman. Use a rubber mallet to hammer them in without damaging the surface of the nail heads. I placed the nails about 1 inch apart and used a pen to mark all of the holes, so they would be in a straight line. And there... you're done! Now you have a great and much more inexpensive upholstered ottoman, in the fabric of your choice! I seriously can't deal with how handy you are. This looks amazing!! 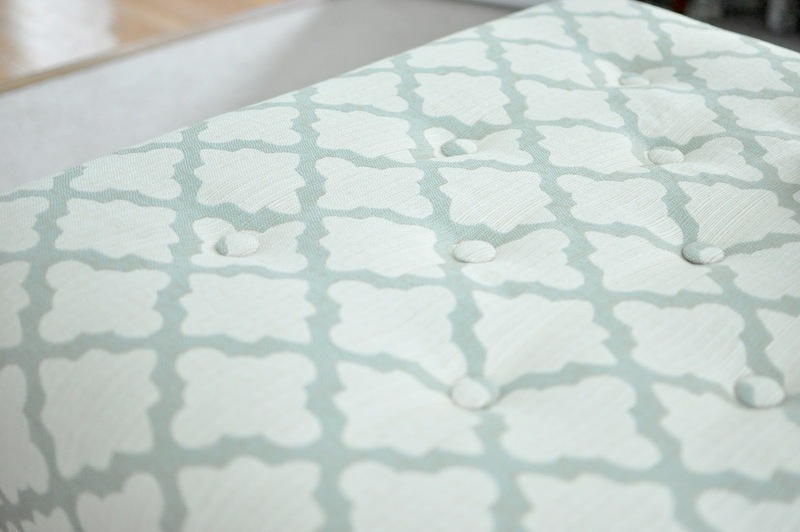 And I love the grommets...it really finishes the look perfectly! Find Blue Waffles Disease | Blue Waffles Disease Pictures At http://www.bluewafflesblog.com/ for free. You can watch euro 2016 live stream , match schedule, euro 2016 fixtures, tickets and more for free @ http://www.euro2016livestream.org/ must visit. Wow, that looks gorgeous! The whole room is beautiful! Very cool!! It looks fantastic!! Wow this is amazing. Great job on this transformation. this looks BEAUTIFUL... new follower, and you MUST be a decorator, no!? Thank you! Nope, I'm not a decorator, just like doing things like this for fun! I was looking for an ottoman, and I found this site. I have an end table that I am going to make into an ottoman with your instructions. I can't wait to get started!! Joann's is having a big sale, so I'll get the foam and fabric. I will send a pic when it's finished. That turned out beautifully!!! Your room is beautiful as well. We had a coffee table VERY similar to it and recently sold it on Craigslist to someone who was planning on doing the same thing. I hope hers turned out as well as yours! What a clever idea! And I love that fabric! Can you share where you found it or what the name of it is? Thanks! It's called Casablanca Geo in Aquamarine by Robert Allen Home. I got it from lsfabrics.com. Kathy, I bought 2 yards of decorator width fabric. That was plenty for me. Just check the dimensions of your table. I think it was about the same amount of batting. You just need enough to cover the top and sides of your table. This is beautiful!! 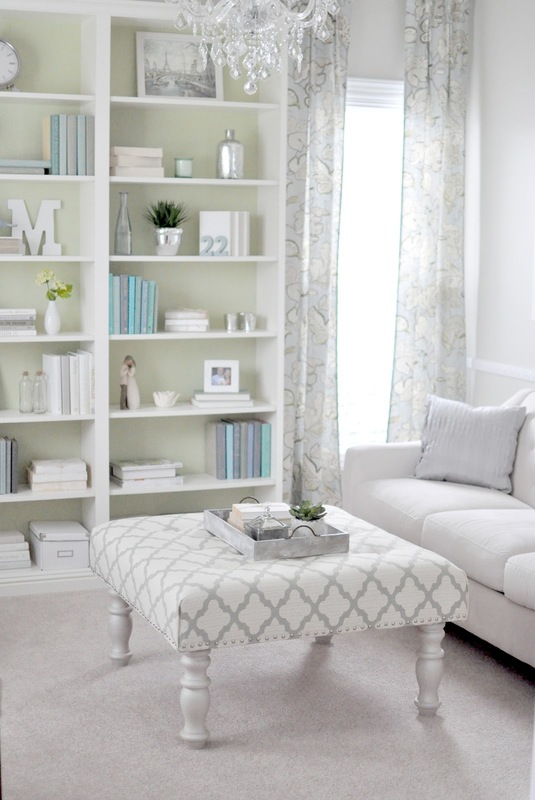 I love the rest of your space too and the styling on the bookshelves looks fabulous! If you get a chance, I would love it if you shared this at my link party on Tuesday night. Pinned this and off to check out the rest of your blog! This is beautiful! Did u cover the buttons or buy them that way? I love it! I am amazed at the crisp, clean corners - did you actually sew the fabric together at the corners or tuck it? Can you give a few more details? Very professional job! Thanks! I basically did a very tailored hospital corner-like fold. I made the crease to go straight down the edge so it would be simple and clean. I didn't stitch the edge of the corner, but you could easily do that too! Hope that helps! wonderful idea, thanks for the insight, I have the same broyhill coffee table, and wanting to get rid of it. Now I have something to accomplish!!!!!!! Me again! Just wanted to let you know that I will be featuring this tomorrow over at Clean and Scentsible. I just love this and your room reveal is fabulous! Enjoy the rest of the weekend! I absolutely loved this idea of yours and have shared it with a link back to your blog on a post I feature weekly on inspiration from around the blogasphere. I do hope you like the post and get some new readers through the link back. I am linking this post up to a few blog parties this week so I am sure you will get a bit of traffic back. 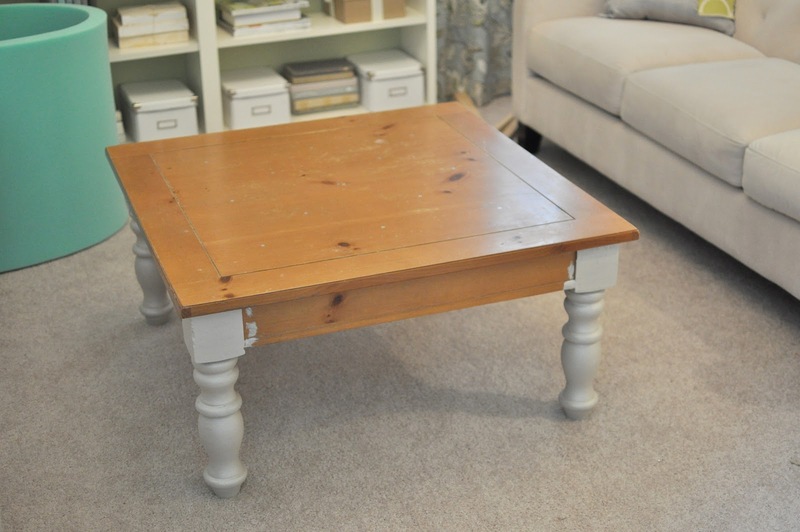 I found a coffee table on craigslist exactly like this! I am so excited to make it thank you for the inspiration! How much fabric did you order? Was one yard enough? Worried it won't fit all the way around! The top of my table was 36x36". I bought about two yards, but I think you could get away with 1.5 yards, especially if it is decorator fabric, which is wide. Figure out how far around the sides you will wrap down and how many inches of foam you'll need and add that to the width to figure out your minimum fabric order. For example, table was 36, and I allowed for 8 inches of fabric on each side, 36+16= 52"... so I needed at least a 52" square of fabric. Hope that helps! How much foam did you buy? 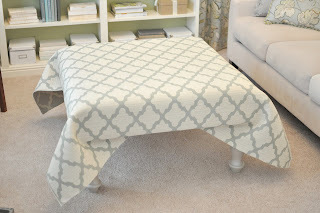 I LOVE THE LOOK OF THE OTTOMAN, IT'S CHIC, SOPHISTICATED AND JUST PRETTY. Did you make your own buttons then? The fabric matches perfectly so I'm thinking so. Is that very difficult? They have instructions on the package, but basically you just cut out a circle of fabric and wrap them around the metal and secure it. Then, you're ready to place the buttons. This is LOVELY!!!! Great tutorial! I love your blog and I'm your newest follower! This is incredible!! 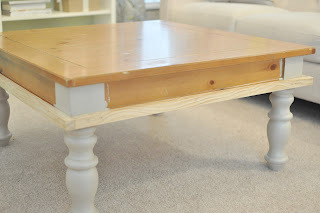 Do you think it would work using a palette and short table legs from home depot instead of an old table? Hi Kaitlyn, I'm not sure about the pallet, but it might be possible. You would want to make sure that the pallet is structurally sound and wouldn't break if you sat on it. I would probably put a piece of plywood on the top under the foam so that there would be a solid surface to support the foam. Hope that helps! I love the fabric you used for this. Where did you get it? Hi, it's amazing! I have similar coffee table and i haven't any idea what to do with it but now I know. I find you on pinterest and i will follow your blog. Kind of new to blogging world, Pinterest etc. How do I follow you on Pinterest? I don't see the "P" button to click on. I just added a new Pinterest button on the left sidebar. You should be able to click it and start following me! Thanks! This looks amazing! Now I need to find an old table. I kid you not, I have the EXACT same table and the same little cordless drill! I think it is a sign...time to make an ottoman. 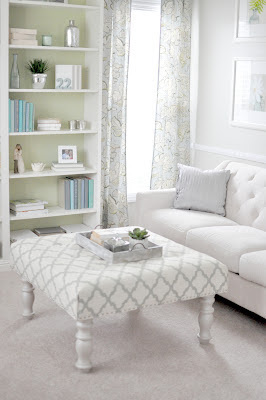 I found you through Thrifty Decor Chick and your ottoman is Fantastic! I love your choice of colors and the workmanship looks beautiful. I'm going to give it a try!! Thank you! Fabulous Job... I love this idea and I love your color/fabric choices!! 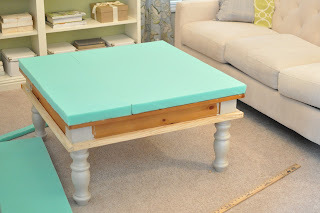 Came across this on Pinterest and I have the exact same table you started with, how funny! I'm dying to get started on this project over the weekend. Can you provide a few more details around how you added the wood around the bottom in the first step? 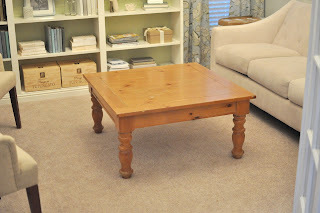 Hi Laura, I bought 4 1" square pieces of wood that were 35" long and hammered them into the base of the top with nails. You can kind of see this in the 4th and 5th pictures. I got these from Home Depot, in the molding and dowel section and had them cut the wood to 35" long, so that I could put 4 around the edge. This is also an optional step. If you would rather, just use a lot of foam and staple your fabric onto the backside of the table. 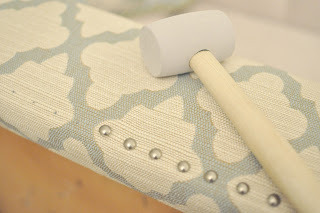 However, you probably wouldn't be able to use nailheads if you did that, because you need something to hammer them in to. A-MAZ-ZING! Found you via Pinterest and I am so glad that I did!! 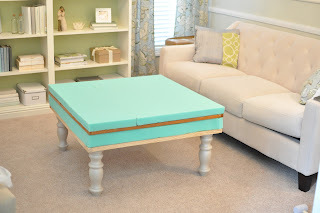 I must try to make one of these...I see these coffee tables on CL all the time. Thank you for sharing your tutorial. Do you mind if I ask where you found the silver nailheads? Thanks so much for answering my question...I did not even know that JoAnns carried these! 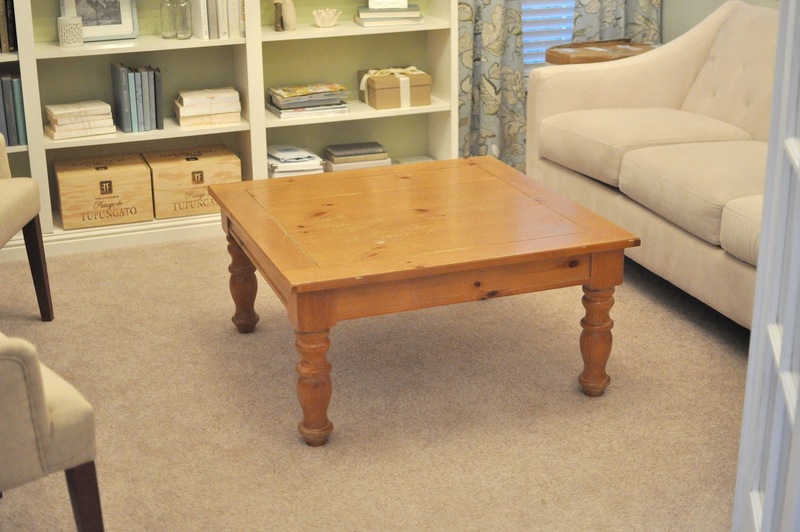 I just recently purchased this exact table off of Cragslist with the intention of turning into an ottoman. Joann's has the foam 60% off with an additional 20% coupon this weekend, so I plan to get it while it's dirt cheap. My question is: How many yards of foam did you use for this project? I used about 2 yards of the 2" foam. I needed a 36x36" square for the top (which I made from two pieces, one 24x36 and the other 12x36) and some for the sides. I was checking out your fabric you used ...and online it looks kind of green but in your photos it looks like a greyish blue...can you tell me which color yours looks more like? The color fabric is called aquamarine and though it has some green in it, it definitely has a blue grayish look as well. i think my photos are pretty true to color, but it could look different with whatever fabric colora you are pairing it with. You might want to order a swatch if you are unsure. Also...my husband will be making ours from scratch...could you tell me the length of the legs on your ottoman please? The finished height of the ottoman should be about seat height or a little lower. So figure out what the seat height is of your couch and then make sure you take into account the height of your foam and support to figure out what the legs should be. I think most ottomans range in height from like 16-20" tall. Best tutorial I've seen for this so far, I've just started buying the materials to do one of these myself. Thanks for sharing. BEAUTIFUL!! The only thing I didn't get is how to put the buttons using the needle. Hi, Love the ottoman, and the rest of the room! I am wondering about the fabric on your pillows and curtains. Can you tell us the name and where you purchased the fabric for the curtains and pillows. The curtains are Leaf Cloud by P. Kaufmann. I ordered the fabric from LS Fabrics. Meredith - can you describe how you folded the fabric around the corners? Thanks! It's basically like a hospital corner for a bedsheet. I tucked the corner excess back under one of the sides and then wrapped everything around under tightly. This creates a seam right at the corner, which is less noticeable than other techniques. Hi Meredith! How much would you guess this project cost you in total? So cute by the way! Hi Ali, I would say, it cost me between $50 and $75. I already owned the coffee table, so I'm not counting that cost. It might vary based on the price of the foam and fabric you select, but nevertheless, it should be way less than an ottoman you could buy! this is fantastic! we have a big wooden coffee table but since my little man has started crawling he keeps bumping his head and we were thinking of getting rid of it. now i'll just do this! perfect baby-proofing solution! I just bought the essentials and was wondering where you bought the foam? I bought the foam at JoAnn's Fabric store. I think you might be able to get it other places too though. 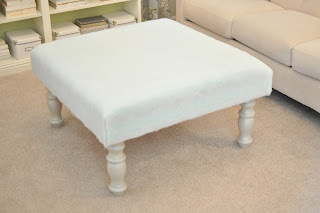 I think upholstered footstools are much nicer looking than wooden footstools and besides they are much comfier. Thanks for sharing this post. Very cute! I have all the items together to make mine this weekend except for the button covers. Can you tell me what size button covers you used? There are several sizes to choose from. Thanks! Lauren, I think the ones I used were about 1-1-1.25 inches wide. You can use whatever size you like best, I thought these were a good size for the size of my overall ottoman and the number of buttons I wanted. I love this room so much! Love those wood with the table...defiintely a great mix! Thanks for linking up! I'm in this crazy DIY phase! 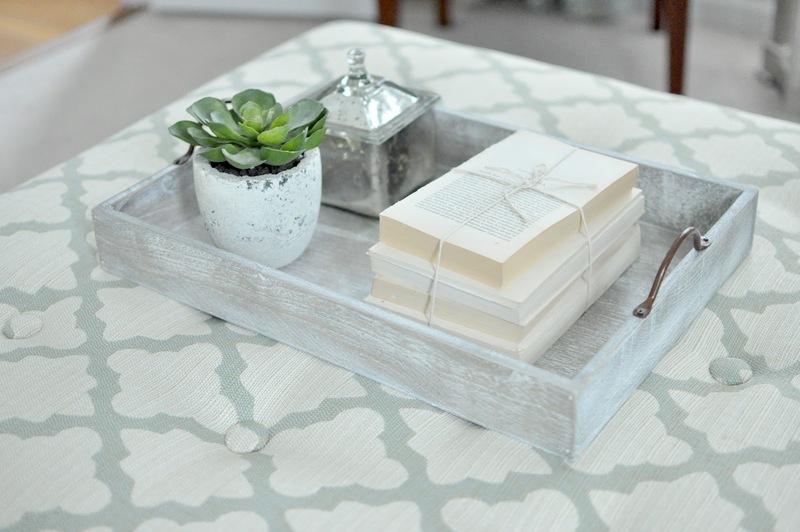 This is the perfect realistic project that I look forward to trying!Thanks for sharing! Amazing work so far. Try to visit our site, we are very glad to share our own recipe of cleaning upholstery. Where did you get your sofa? 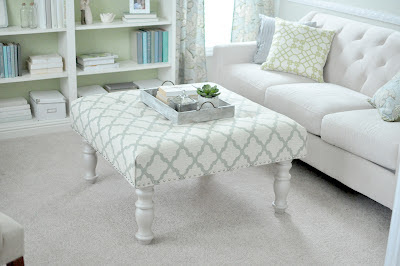 Love the ottoman! Thanks! The sofa is from Macys. It's the Chloe sofa in Ivory Velvet. This is beautiful. I did this with an oblong coffee table that was my parents when I was growing up. I enjoyed the project so much! This makes me want to find something else to upholster. 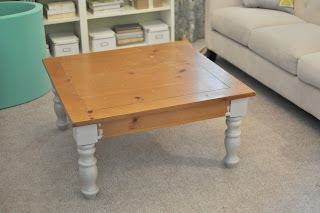 Love the table, going to make mine soon.I understand everything except how long exactly was that needle you used? I feel like I would loose the needle in the foam or something. I know this maybe a crazy question, just want to figure this out before i go all in. thanks! Wow! This is amazing! It looks professionally done. Amazing job! I have the same question about the needle as someone above had. How long of a needle did you use? I have a hard time understanding how I could get it to go through all that depth of batting and foam and reach it on the other side. Much less come up where I actually want to be. I actually went to Joanne's fabric and bought a 3-4 pack of needles that are 6, 8, 10, 12 inches long for this kind of project. It looks like I may need to use the 12 inch needle. Love this! Do you know the name of the table or where you got it from? I got the same exact table from my local Habitat for Humanity for $25! Super excited to start. What a great idea! I would love to feature this on one of my blogs (using a pic) with a link back to find the instructions! It's a really beautiful transformation ! I see you use it as a table. But can we also seat on it ? I love this idea. I wan to try this ottoman thing. It is really easy to do, I will have to give it a go. The easiest method to look around would be to think about just about all feasible choices within the surrounding area. A person for those who have contacted loans with regard to company funding loans money permanently leads to which smaller businesses should have arrived at understand. Should you obtain a loan as well as obtaining authorized or even declined should go through an extended as well as complicated procedure. However the current press conscious of exactly where to consider all of them, particularly when you discover funding with regard to smaller businesses provides a number of possibilities with regard to. Consider the aid of web as well as may be used to assistance your company in your town to locate obtainable funding choices. Thanks for this information about DIY upholstery clenaing. I am gonna use it for mine. Do not be concerned because you can now consider the little financial help along with easy payment choice by using pay day installment loans. Along with name loans, you'll need to not be worried about the actual significant financial prices or even thorough payment routine. Download happy fathers day pictures stock photos. Affordable and search from millions of royalty free images, father's day imagesphotos, fathers day images and vectors. Thousands of images added daily. Thanks for the share loved reading the article, please do share more like this with us . I wanted to know the measurements/thickness of the wood pieces you used at the bottom to even it out so you could add the nail heads to? 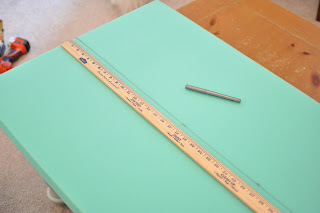 I ask because I went to Home Depot this past weekend so excited to start on the project and I thought the thickness was 1 inch according to my measuring tape. The wood at Home Depot that says 1x2 ect, is not actually 1x2 but more like 3/4 of an inch, etc. I didn't realize that the size is not what it really is. Any sugguestions on the wood I can buy for this project as I don't have access to any tools to cut this down. Home Depot said they can't shave anything down, only cut things in half, ect. Very cool information my friend this is amazing and great information. good luck. Means of DSS refers to Department of Social Security is launched by UK government that offers funds to the disability people every month in the shape of benefit. But such people are having poor financial assistance as they can apply for loans for people on benefits are available there to offer you the sufficient money based on your fiscal requirements. The most convenient thing is that you do not need to pledge any security as collateral to the lender for securing the fund. Under the provision of loans for people on benefits you are allowed to acquire small cash aid varying from £100 to £1000 till an easy repayment period of 2-4 weeks. Taking this loan you can meet with various short term expenses such as unpaid grocery expenses, credit card bills, outstanding bank overdrafts, sudden repairing of car, house rent, child’s school or tuition fees and so many more. These are short term monetary products which have another beneficial feature that is no credit verification done. It means that you marked with CCJs, IVA, arrears, defaults, skipped payments, late payments, foreclosures, bankruptcy etc are welcome to enjoy payday loans for people on benefits without getting through the credit check. Moreover, filling out a simple online application form with some basic details including full name, address, bank account, email id, contact number, age et cetera and then submit the form on the website. If once, the loan is approved then money is sanctioned direct into your bank account safely in just 30 minutes. What a beautiful and serene home you have, but considering your talent, I am not surprised. Thanks for this great idea and the well-done instructions. I think that the transformation of anything can happen, as long as its done the right way and by the right person. This is such a nice table, and no one would believe that it would turn to be that beautiful and elegant. Reliable Online Content Help Thank you for sharing, the work you've done is highly commendable.